I know Christmas is still eons away, but it’s not every day one gets the chance to visit the Peterson branch of Santa’s Workshop and see what the Sallynoggin elves are up to, much less take photographs and bring back a report. So turn down the air-conditioning (if you’re here in the hottest part of the U.S.), don your Aran sweater, put on your favorite Christmas music, and take a look. I didn’t think we’d see another Elf Army, but I am happily proved wrong. 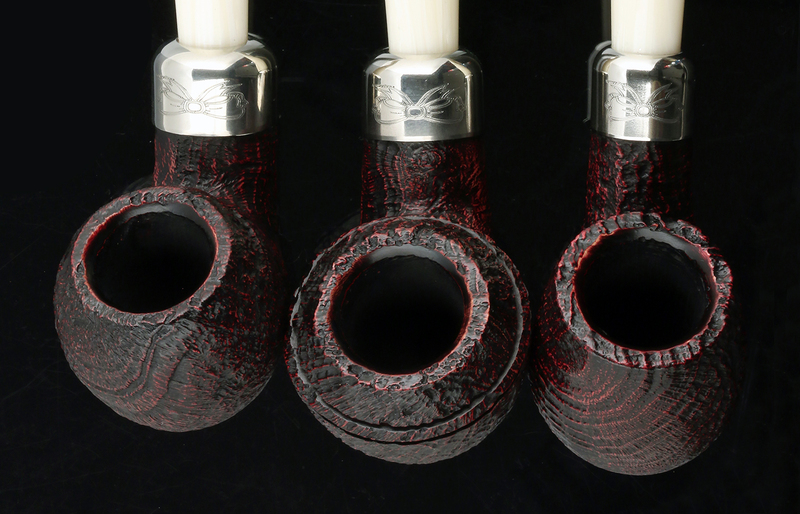 This year’s lineup, as you know from earlier blogs, features the full “12 Pipes of Christmas”—for 2017, shapes 01, 03, 05, 69, 87, 106, 408, 999, X220, XL02, XL11, and XL90. 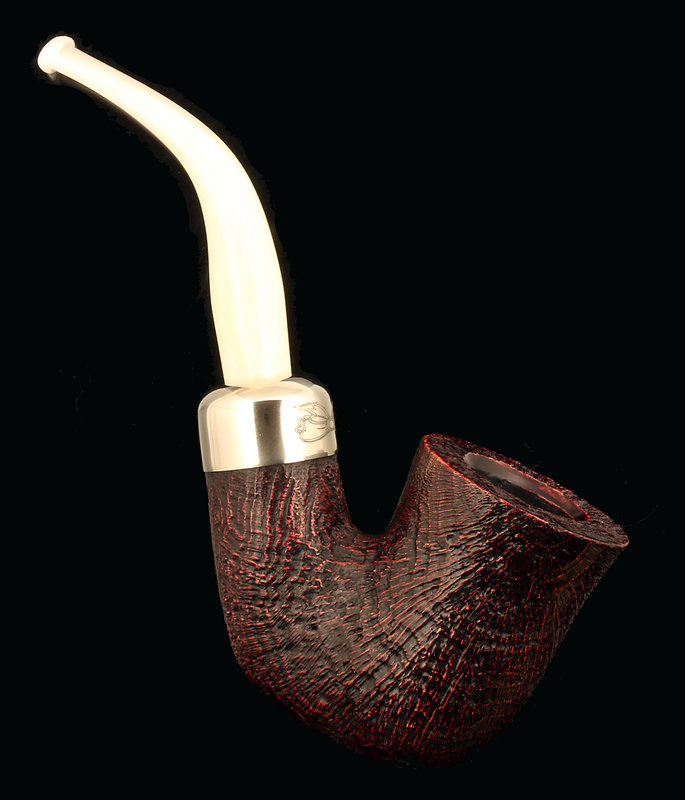 Eleven are from the Classic Range shape chart, but the twelfth, the XL11, is the “Original” Sherlock Holmes shape designed by Paddy Larrigan back in the 1980s. 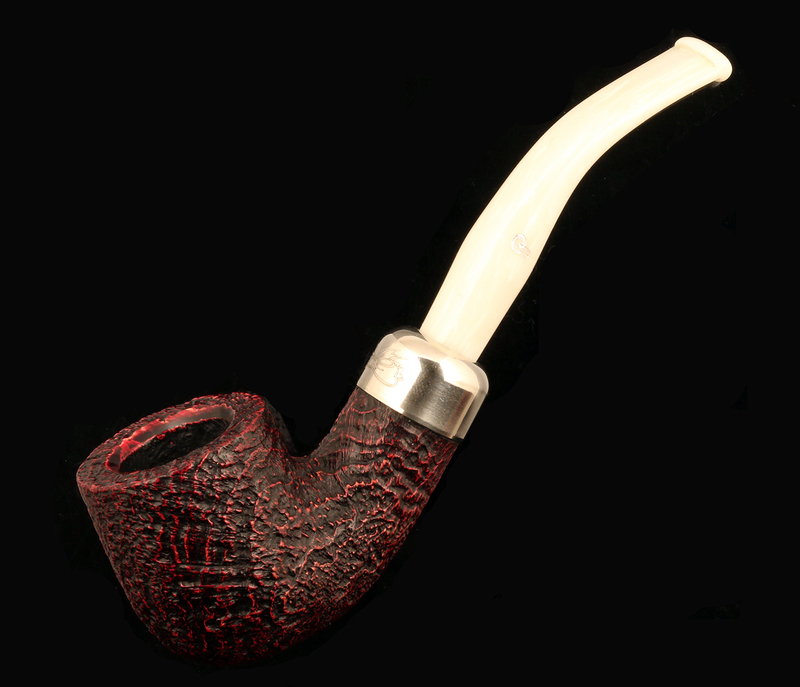 That’s two straights and ten bents, as usual in a variety of chamber dimensions to suit almost anyone’s tobacco preferences. The “Elf Army 2” (ask for it by name!) 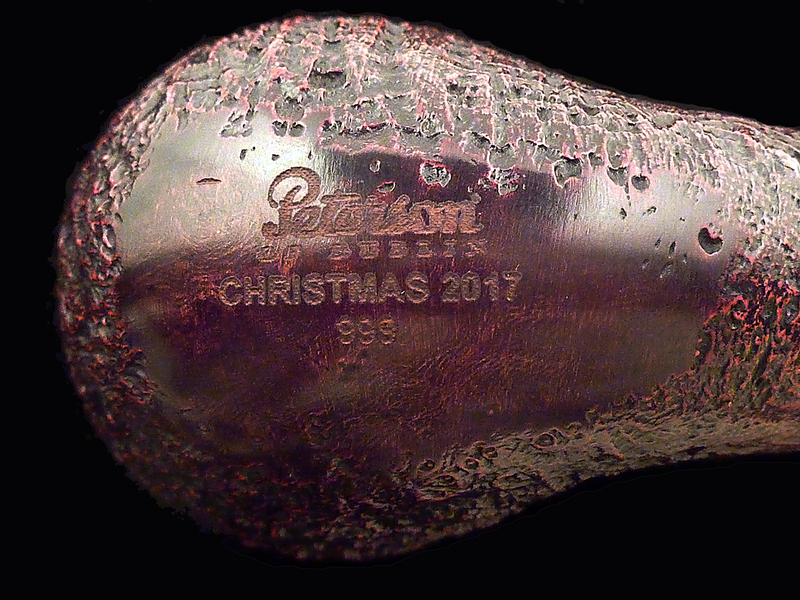 features a nickel mount with a laser-engraved bow on the top of the ferrule and the classic K&P over PETERSON nickel stamp on the bottom. 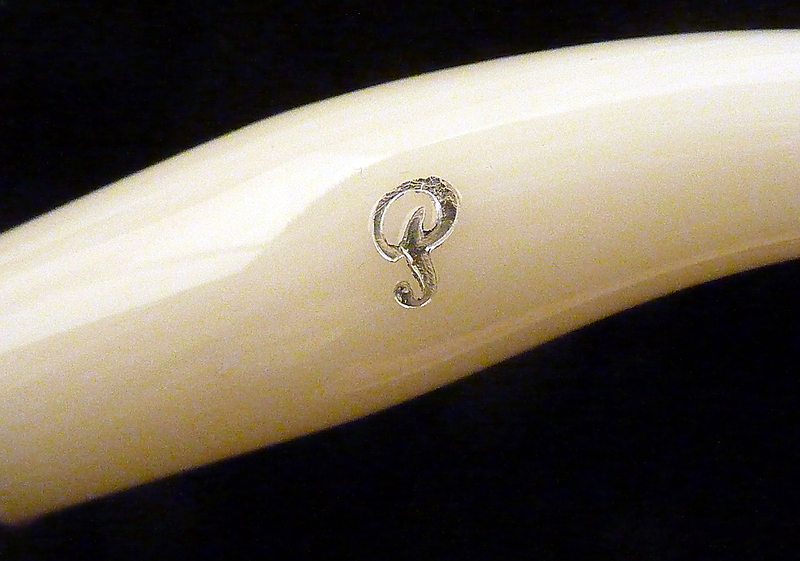 The laser-stamping of the bowl gives full documentation, as you can see, of the line, the year, and the shape number. Bravo. 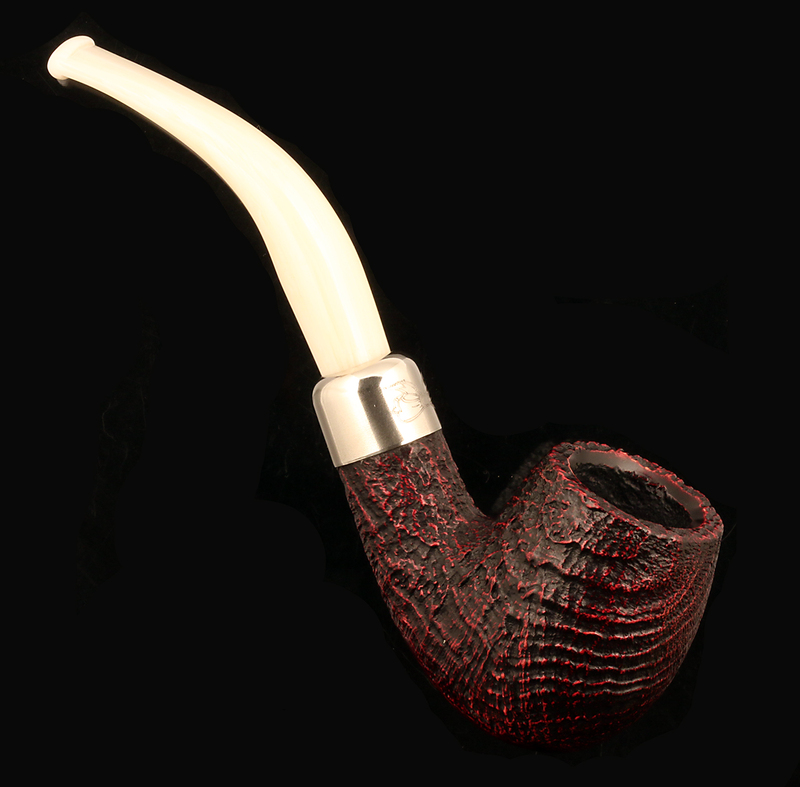 The stain is a deep brown over red contrast, producing a suitably seasonal ember-glow effect. 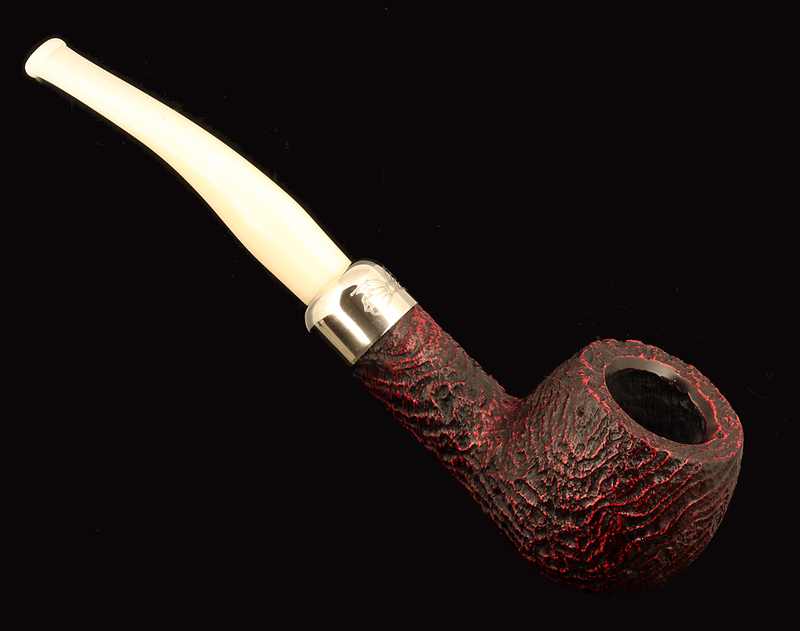 The blast on the ones I examined is also quite nice, as Peterson continues to improve in that department. Sometimes the blast will be quite striking, and on the whole, it’s even craggier than some of the current spigot lines, which suits me just fine. I don’t mind saying again just how soothing a good sandblast can feel, rolled between thumb and fingers after a long day. 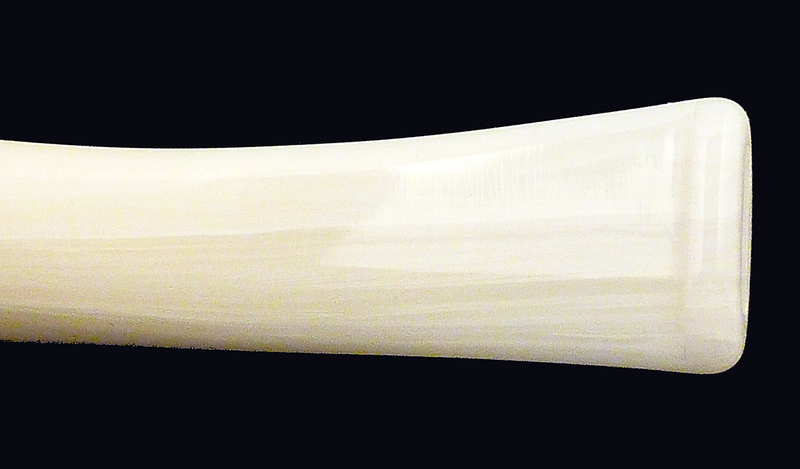 The acrylic fishtail mouthpiece is widely slotted, featuring a silver hot foil-stamped P.
As you can see from the detail photos, the acrylic rod isn’t white, but a lovely striation of creams, mostly straight but varying just a bit from stem to stem. It will be difficult to see these photographed against white, like most e-tailers do, so I thought I’d set it them against black to give you a little better look. 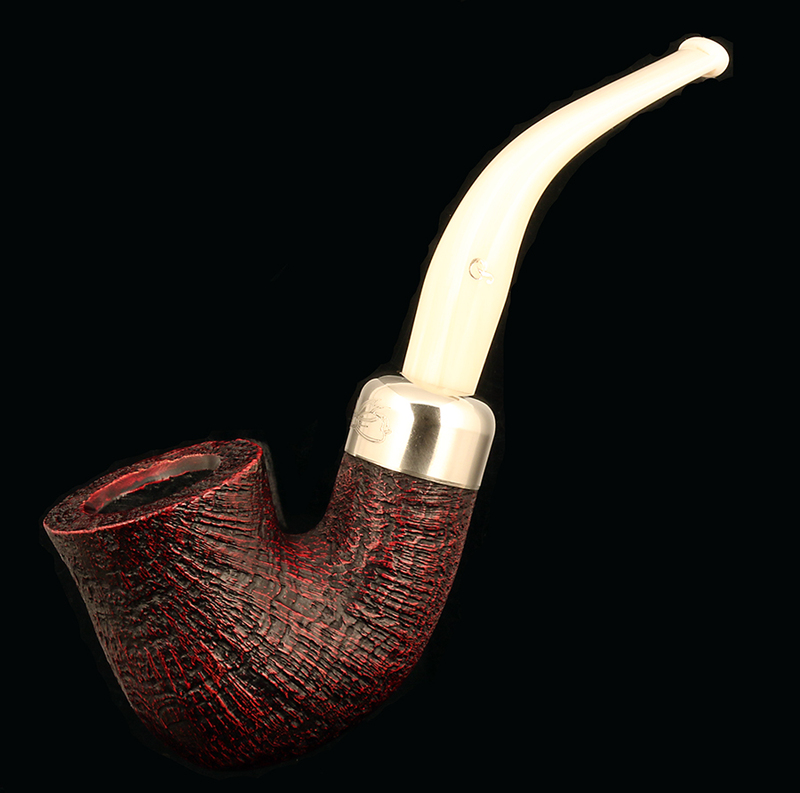 I’ve been trying to learn how best to smoke a Peterson fishtail army-mount, because it doesn’t behave for me like a System, a P-Lip, a spigot, or a fishtail “Navy-mount.” When I try to use my usual smoking style (long drafts), I find it smokes too hot and is less flavorful than other Peterson mounting styles. Recently, however, I’ve learned that short draws seem to make all the difference, bringing back the flavor and dissipating the heat. If you smoke an acrylic-stem army-mount, please chime in and let everyone know how it works best for you. Next: Can it be? The Last of the B Shapes Catalog! Hopefully they will be available soon! 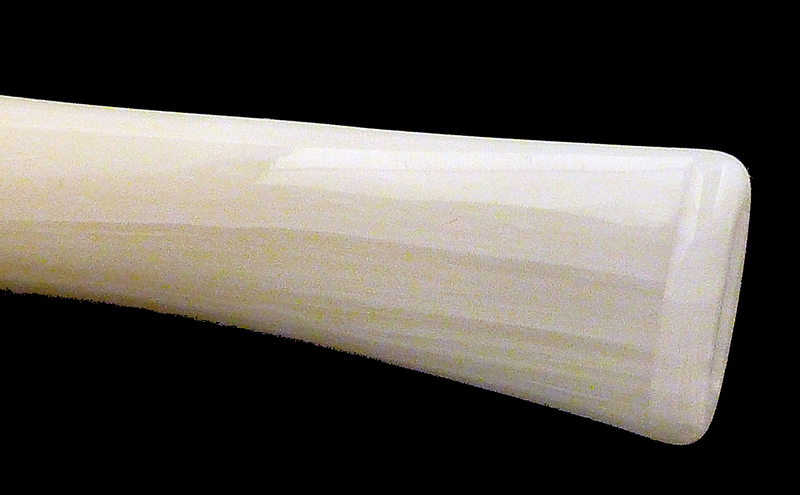 I love white/cream colored stems, that 999 is looking very appealing to me! I’m with you on that, Al. A 999 will be on my wish list this year! Great Blog Mark. 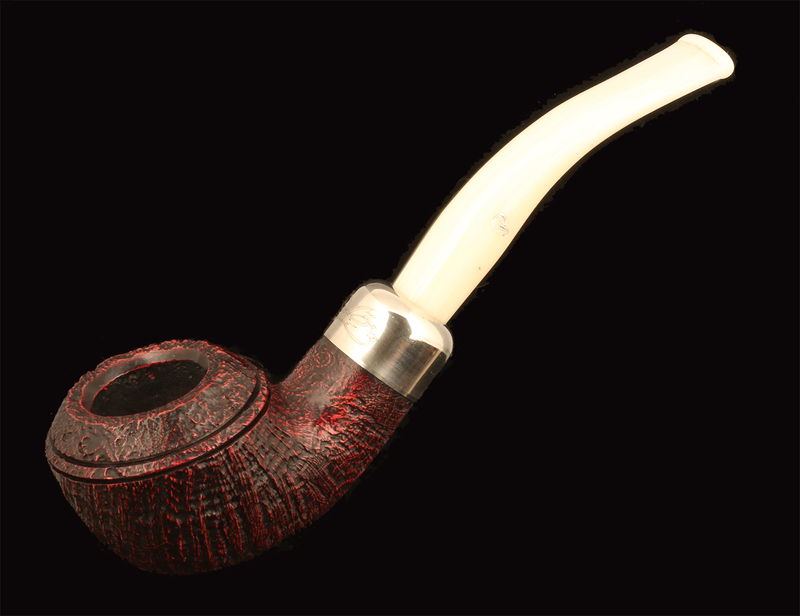 I love the Peterson Military mount pipes and have the D8 and shape 69. I will try to do short puffs to see if there is a difference as you suggested. 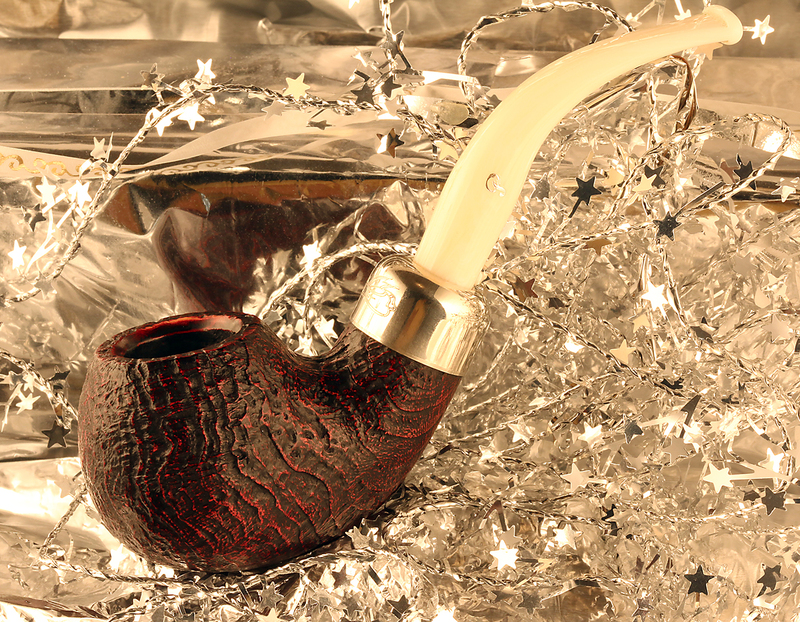 Conversely, I do notice if the pipe is going out, long puffs usually get the tobacco burning again. 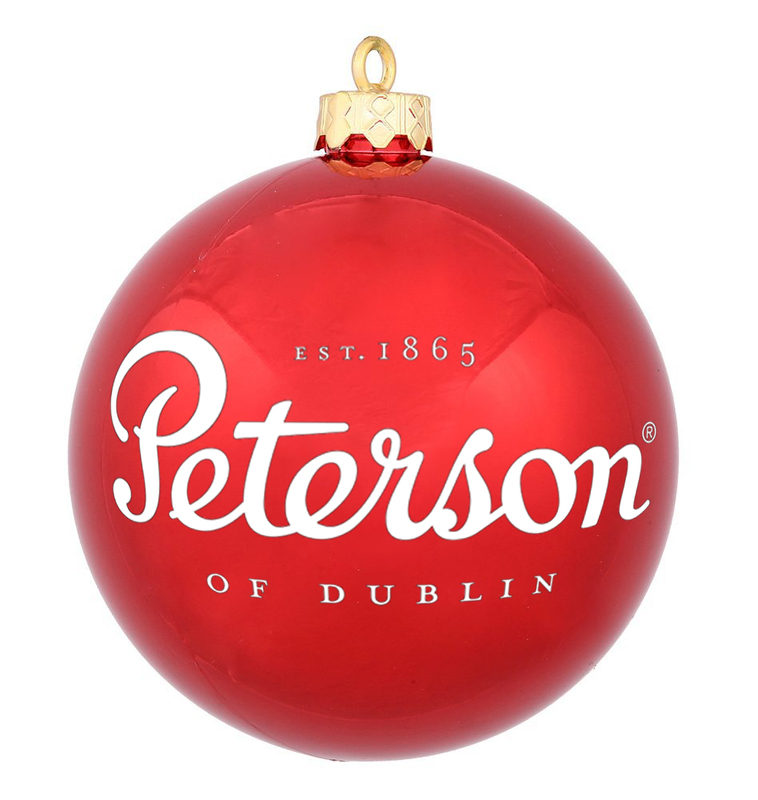 Keep them coming, love my Peterson’s. Thanks, Steve. I tried your short-puffs method last night with my XL339 Derry, and it seemed to work. 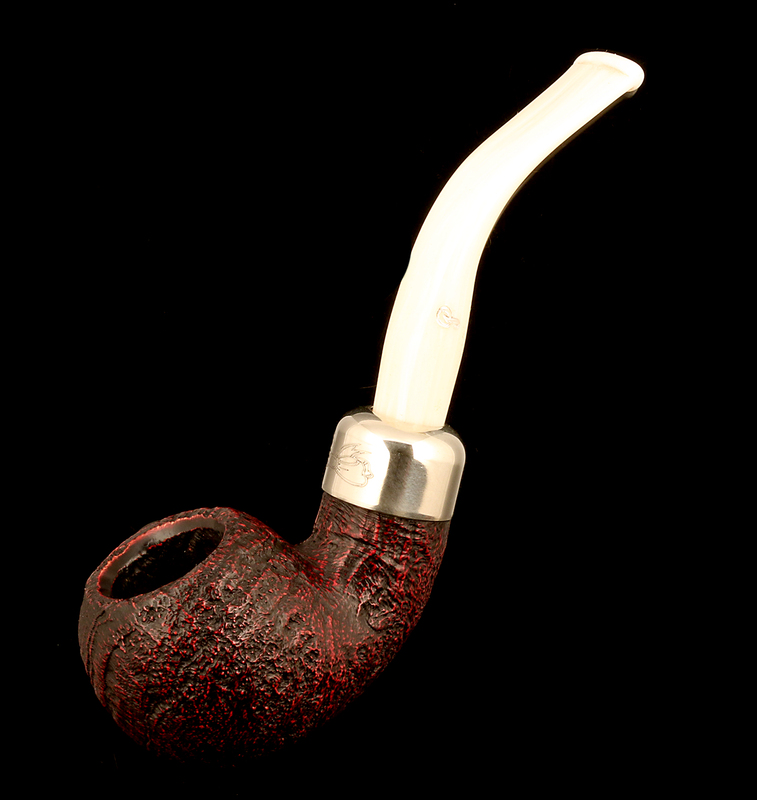 Very different from the “long draw” I use on the P-Lip Systems, but I’d like to smoke this kind of pipe if I can just figure out how to do it without tongue-burn!